Multi canvas art - More than 750 motifs + FREE Shipping! Everyone has seen them: Multi canvas art prints have become a popular item of home decoration in the past few years. 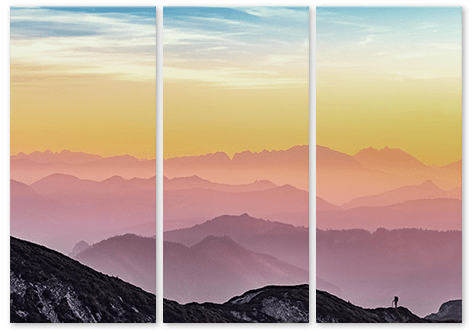 Not only does this multi panel wall art display spectacular motifs but the arrangement of the individual canvas panels, too, provides an interesting design element. This is what makes multi canvas art so appealing in modern interior design. Multi panel wall art is available now with a huge range of motifs and various formats. 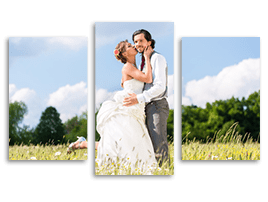 We offer multi panel wall art with 3 or 5 panels. Sunsets or spectacular landscapes are particularly popular themes for multi canvas art prints. These are purchased both for the home – for the living room or bedroom, for example – and for the office. Multi canvas wall art inspires not only because of its complex design: The production on a wooden stretcher frame also fascinates the viewer since this creates a three-dimensional impression. This turns multi canvas wall art into impressive three-dimensional artworks and real eye-catchers in any home.